The NCA recognises that bringing new fanciers to bird keeping is essential for the long term success of this marvellous centuries-old hobby. The Welcome to Bird Keeping booklet was produced by the NCA in January 2010 and updated in July 2013, with this in mind. It is a hobby that can be enjoyed by people of any age, background and pockets. The booklet, 16 pages in colour, describes some of the things that need to be considered before taking up the keeping of birds, whether that be a single pet bird, a mixed garden aviary, or a collection of exhibition birds. 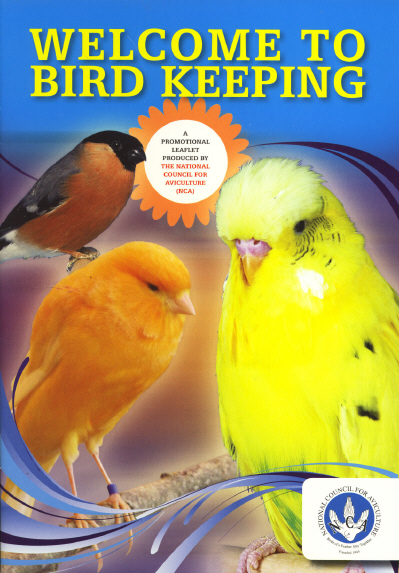 It is essential reading for those interested in or proposing to take up bird-keeping. Excellent photographs illustrate some of the birds that have been kept and bred in captivity, but we cannot illustrate all the different types of bird kept by enthusiasts all over the world - especially in Great Britain. To obtain your free paper copy please send an A5 sized envelope with 50p stamp to the NCA Secretary, Ghalib Al-Nasser, Evenstar, Pinkuah Lane, Pentlow, Sudbury, CO10 7JW. Alternatively click on the image for a pdf version. This organisation is the umbrella organisation for all cage bird enthusiasts catering for the British, Budgerigar, Canary and Foreign Bird Fancies. Its prime objective is to promote the welfare, study, breeding, development and exhibition of birds within a managed environment. parent organisations. Please visit often for the latest news.